← Duck Necks, Goat Bones, Chicken Feet, Tripe! 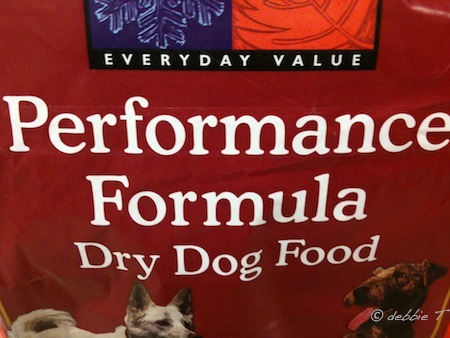 In my opinion, Whole Foods 365 Brand Performance Formula Dry Dog Food is just as poor as Purina, Science Diet, Iams, Eukanuba, and maybe even Alpo and Ole Roy! Ha! But it’s probably flying off the shelves because consumers trust Whole Foods and the 365 brand name. Problem is, most wouldn’t think of flipping the package around to read the label! And if they did, would they even care about the ingredients or understand how poor they are? I am sure some would be just as appalled as I am that Whole Foods could actually offer this horrible kibble to their customers! Chicken by-product meal, rice, corn meal, chicken fat (preserved with mixed tocopherols and rosemary extract), corn gluten meal, ground wheat, beet pulp, natural flavors, flax seed, dried egg product, canola oil, brewers dried yeast, salt potassium chloride, taurine, l-lysine, rosemary extract, l-carnitine. Vitamins: choline chloride, vitamin E supplement, vitamin A supplement, ascorbic acid (vitamin C), vitamin D3 supplement, niacin, calcium pantothenate, thiamin mononitrate (vitamin B1), pyridoxine hydrochloride (vitamin B6), riboflavin supplement, folic acid, biotin, vitamin B12 supplement. Minerals: zinc, polysaccharide complex, iron, polysaccharide complex, manganese polysaccharide complex and polysaccharide complex, zinc sulfate, copper sulfate, manganese sulfate, calcium, iodate, cobalt carbonate, sodium selenite. chicken by-product meal…yuck. Defined: dry, ground, rendered, clean parts of the carcass of slaughtered chicken, such as necks, feet, undeveloped eggs, and intestines — exclusive of feathers except in such amounts as might occur unavoidably in good processing practices. It’s not as digestible or nutritious as more expensive, higher-quality muscle meat. Avoid it! Avoid it! Avoid it! On the Whole Story Blog, they try to justify their choice to use animal by-products because it is supposedly from “human grade” meat. Come on! The use of the words “human grade” for dog food sounds soo comforting to the consumer, but truthfully there is absolutely no regulation or official definition for that term. PLUS, pet food companies use that term very liberally in their marketing but do not and cannot actually include it anywhere on the package label. I suggest reading Honest Kitchen’s article concerning what Human Grade Petfood really means. corn meal and corn gluten meal – cheap fillers! Plus a lot of dogs have corn allergies – a problem that makes them smelly and itchy. Corn is one of the top Genetically Modified (GMO) crops in the US – and highly treated with pesticides. It’s also government subsidized which makes is super cheap to use as pet food filler. ground wheat – more filler. Why add so many cheap carbs. Dogs don’t need it, but it’s a cheap additive for petfood companies. natural flavors – uh huh. What is exactly does the term natural flavor mean? No one really knows, and they don’t have to provide any further info on it. Another sneaky way to load poor quality ingredients into pet food, to enhance the flavor of corn and chicken by-products! beet pulp – a by-product from sugar beet processing. And did you know sugar beets are also a gentically modified (GMO) crop? Grown using Monsanto’s Round-up pesticide resistant seeds? Do you want to feed your dog pesticide-laden GMO food products? No, not me! canola oil – another GMO product, highly refined and processed. It’s something I try to avoid in human and pet foods. brewers dried yeast – a by-product of the beer industry. Gee, what a surprise! another way big food companies can use their off-products to make more money! It also can cause allergy problems in some dogs. salt potassium chloride – salt? Sorry, but dogs don’t need added salt in their pet food. It’s just a way to make the crappy ingredients taste better, and more importantly, a sneaky way to get the dog addicted to their brand of dogfood, sort of like human addiction to potato chips. So you don’t believe me? How about believing the Whole Dog Journal? They listed Whole Foods 365 brand dog food as the 2nd worst choice on their list of dogfoods. I think what pisses me off the most is not that they are using sub-par ingredients, that’s nothing new in the petfood industry. But they are sullying their good name and providing such a poor product to the consumer. I am not naive, I know that I have to read labels EVERYWHERE, including at Whole Foods grocery, but because this product is so bad, it makes me question what else they are hiding in the human food world. All to make a hefty profit! This entry was posted in petfood, Terrier Health and tagged by-products, corn, dogs, genetically modified, GMO, health, petfood, unhealthy, whole dog journal, whole foods 365 Performance Formula, Whole Foods grocery. Bookmark the permalink. 4 Responses to Review: Whole Foods 365 Brand Dog Food – Poor Choice, Horrible Ingredients! I am so thrilled to have found your post. I resonate with you about eeeeverything. My dog (lab/rottie mix) continues to teach me so much about the healing, medicinal powers of food. For a couple of months, while on Whole Foods 365 Brand our lives – including the dog -were stressed out. We were dealing with big big balls of hair every single day every where. He was constantly scratching, bald in some areas on his legs and belly – I would feel so horribly bad for him. It WAS their food that made my dog sick. It was easy to know because the 365 brand is something that was introduced. I just kept feeding him because I did not want to believe that Whole Foods is selling garbage and crap. Since getting him at 6 weeks, I’ve fed him high quality organic foods. I switched to Whole Foods because of price and trust. This ordeal has -very much -made me question their loyalty and practices around human foods. In fact, I personally feel that I have been blind-sighted by their physical image and have ignored occasions when my own body did react because they were farthest from being suspected as the culprit. I’m looking at Whole Foods in a WHOLE NEW WAY! Glad to hear my post helped, Surya. I still shop at Whole Foods, but I read ingredients very careful on any processed non-whole foods they sell. I hope your baby is feeling better, and you find an appropriate food for him. It’s so difficult to find a decent brand, so many have been taken over by bigger food companies, like Natura, who make California Natural and EVO. They are now owned by Iams/Eukanuba. We’ve been feeding our dogs Raw for awhile, so I’m a little out of the loop about kibble choices, but if I were to go back to kibble, I would buy Orijen. It was what they ate before we went to all Raw. But it’s difficult to find, because they are a small company and they make smaller batches. sooo, if I was forced to suggest other brands, I suppose Wellness or Natures Variety would be good choices as well. Here is a fantastic web site: http://www.dogfoodproject.com/ – it helped me learn a lot about dog food, and what to look for. It’s not just ingredients, but the integrity of the company behind the food too. They have a great community forum too. good luck, and good luck and many blessings to your new baby!!! !